Amazon is slashing prices on more than 500 items at Whole Foods, according to a report from The Wall Street Journal. The price reductions will go into effect Wednesday. The cuts will mostly be focused on produce, specifically on “high quality, peak-of-season produce, including greens, tomatoes, tropical fruits and more.” Customers will save an average of 20 percent off select items under the company’s latest round of price cuts. Amazon is also expanding its Prime member benefits. The company said it’s doubling the number of exclusive deals for Prime members and giving customers who try Prime $10 off their $20 purchase for signing up for a membership. The company announced last year that shoppers who are Prime members get an additional 10 percent off “hundreds of sale items” throughout the store. “When Whole Foods Market joined the Amazon family, we set out to make healthy and organic food more accessible. Over the last year, we’ve been working together tirelessly to pass on savings to customers,” said Jeff Wilke, CEO of Amazon Worldwide Consumer, in a statement announcing the new price cuts. The latest price reductions come as Amazon aims to compete with rival grocers Walmart, Costco, and Kroger, which have all lowered their prices. Amazon is also heading off competition from discount grocers Aldi and Lidl, which have each grown their overall number of stores and expanded their organic product selections. 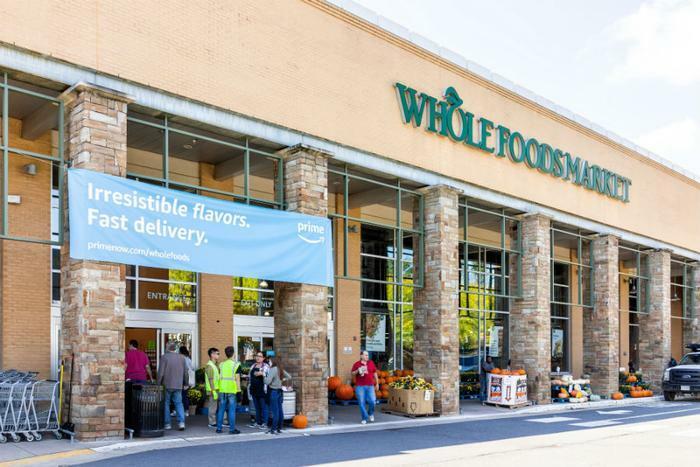 Amazon is also reportedly looking to launch its own U.S. grocery chain separate from Whole Foods in an effort to expand its physical store footprint. Amazon also currently operates several cashierless Amazon Go stores.